Left to Right: Katie Beam (Prevent Child Abuse Rockdale Community Outreach Coordinator), Diane Howington (Director of Prevent Child Abuse Rockdale), Brian Simpson & Paulette Simpson (Owners of High Priority Plumbing). Atlanta Gran Prix Karting and DC Hobbies on Old Oxford Road in Covington are supporting children in Rockdale and Newton counties by hosting the First Annual Drive 4 Hope Event to benefit Prevent Child Abuse Rockdale on August 15th, 2015. The event will invite families to ride Italian Go Karts that go up to 45MPH and Remote Control Truck racing on a dirt track. Proceeds will benefit Prevent Child Abuse Rockdale, a non-profit organization that provides free assistance for their primary Parent Education Program as well as essential resources to help parents who live in the community. PCA Rockdale has been a non-profit organization of prevention and intervention services within our community since 1989. They are dedicated to ensuring children are raised in a safe, loving, and nurturing home free from all forms of abuse and neglect. During this event, PCA Rockdale will be accepting funds, volunteers, and in-kind contributions. When you give to Prevent Child Abuse Rockdale, 100% of your donation supports their programs. None of your donations go toward rent, utilities, and food. The Drive 4 Hope family event will be free to attend. Tickets to ride and drive will be available online for pre-purchase at www.pcarockdale.org/drive4hope. If your business would like to sponsor this event, please contact Katie Beam at 404-401-6983. Prevent Child Abuse Rockdale is seeking partners to assist them with their Grant Matching Program. They have a goal of $55,000 to reach by August 31st, 2015. With the key sponsorship of local company, High Priority Plumbing, they are almost halfway to their goal. 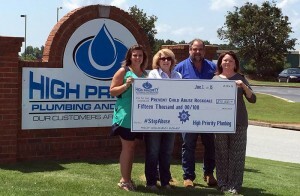 High Priority Plumbing is a proud sponsor for Prevent Child Abuse (PCA) Rockdale and their cause of educating parents and providing them essential resources to help raise a family that is free from abuse and neglect. Donations will help PCA Rockdale continue to be able to provide their free assistance to the parents in Rockdale, Newton, and surrounding areas.